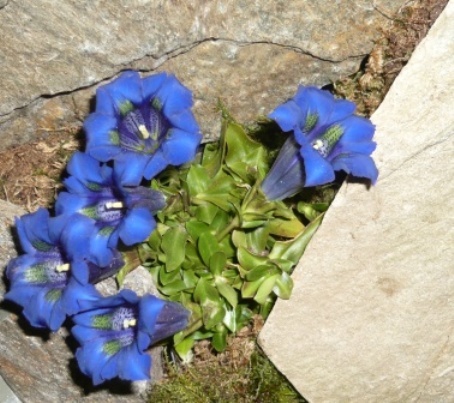 The flower that is most evocative of mountain scenery must be the the Gentian with its alpine associations. Gentians make me blue in the face because I fail every time I try to grow these sumptuous blue flowers. 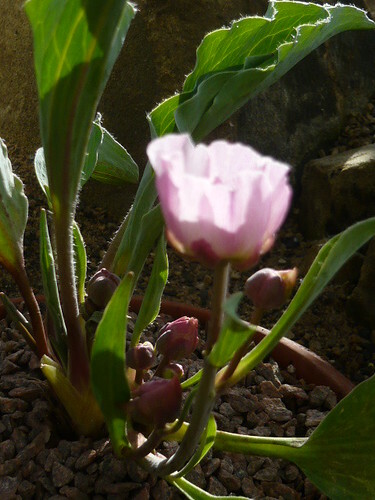 Gentians are known to be difficult to transplant . When seed is sown, it should be fresh or it will not germinate & grow. All Gentians prefer partial shade for at least some of the day. The Fringed Gentiana is a biennial variety which is extremely difficult to grow. I have been guilty of lumping all Gentians under one species as though it was a perennial, acid hating alpine. How wrong I was each variety needs to be understood in its own right. 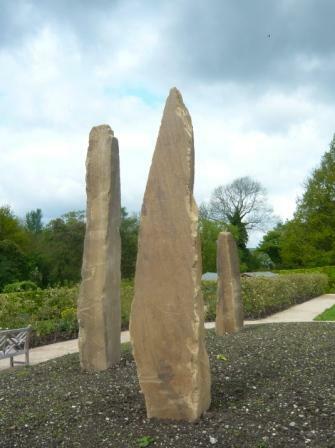 Outside the 2009 Alpine House at the RHS garden in Harrogate are these new ‘Standing Stones’. I am interested to see if the planting links the new building to the sculptures but some how I doubt it. Possibly they are meant to represent the Alps or just be the start of a new part of the garden. 2012 update shows the stones front the much improved vegetable plots. The new building, opened in May 2009 for the first time. Is a tour de force and shows what finance and labour has been put in by the RHS and particularly the local Alpine and Rock Garden Group. 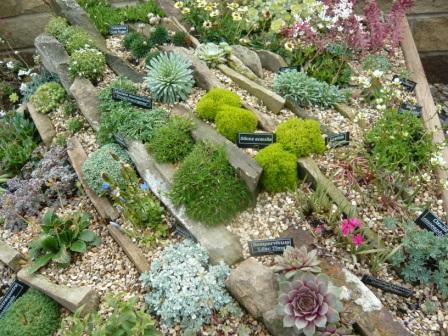 A mixed selection in a 2 meter square raised frame-bed. The sort of thing I want to try in my own garden as it is raised to working height and helps the inspection of small plants. Tufa walls and more mature sink planters are now paying dividends. 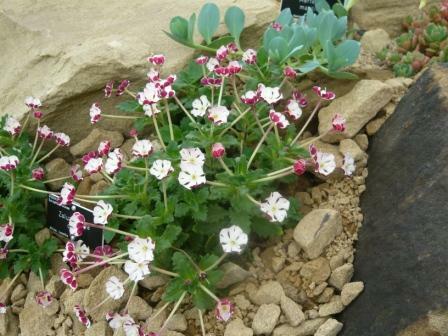 The plant displays always include a good selection of alpines in flower. Crocus and cyclamen were in profusion during November but below are some that took my fancy. Collectors of Snowdrops are named Galanthophiles so should crocus lover be called Iridiaphiles. Perhaps there are already Iridiaphile clubs collecting the numerous Crocus species including the Corsican Crocus shown above. Wikipedia list 80 plus species. 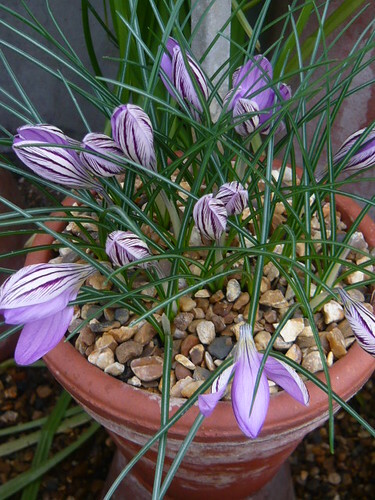 I like the idea of growing crocus in pots in the alpine house so it is easier to inspect the blooms but they ‘go over’ quicker and the water control needs to be spot on. This pot is stood on an inverted pot to get more height on the bench. Corsican crocus are best in a rockery not being robust enough to grow through grass. A sandy well drained soil even in an exposed site should be fine. 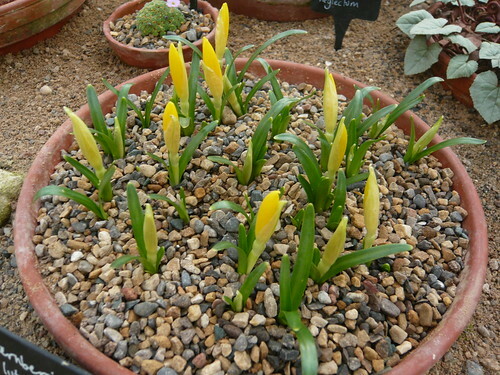 Outdoors they go on flowering for longer than many spring crocus. In early spring is a delight to see the striped buds poking up followed a few days later by the open buds showing a contrast of purples and lilacs plus the sepals, styles and anthers in orange and yellow. .
Ranuculus calandrinioides has an AGM, originates from the rocky slopes of the Atlas mountains, prefers dry shade, grows 8″ tall and has broad white-grey leaves. This member of the buttercup family is dormant in summer. 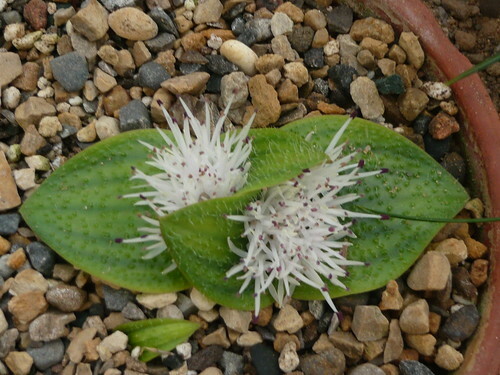 It is easily grown under cold glass but give it as much light as possible. Outdoors keep it dry. The lax growth will be kept more compact if grown hard and started late. 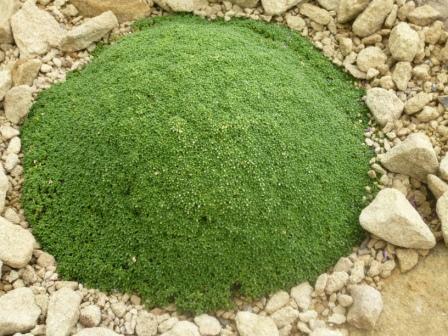 Ranuculus calandrinioides has a thick fleshy rootstock and a lax growing habit. 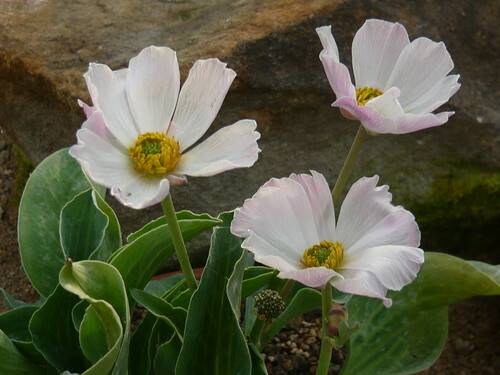 Flowers form a large goblet shape in pure white or a delicate pink. Seeds may be available from B&T world seeds.